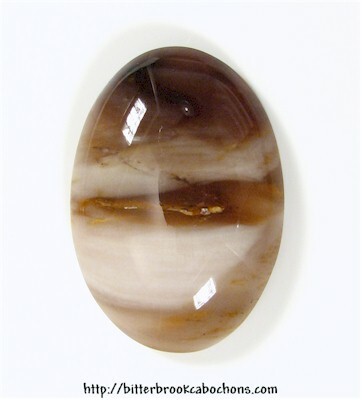 Here's a nice earth-tone Agate oval cabochon. It has a cleavage across the middle which is sealed except for one small spot. The vertical line at the top is a reflection. 31mm x 22mm x 7.5. Weight: 37.75 carats. Do you like Agates? Click here to see all of the Agates on the site! You are visitor number 40 to this page this year.